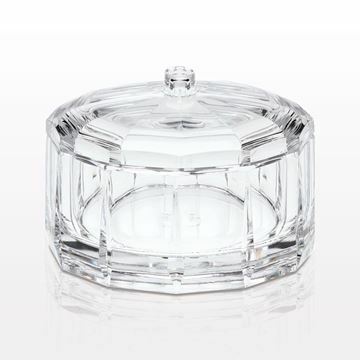 This lovely faceted luxury acrylic container pair provides double storage solution with detachable lids. Use one for applicators, and the other for sponges or cotton balls. Cover them to keep the contents clean between use. Because the containers are attached, they will keep your work area tidy without shifting. Perfect for salon or spa use, they come individually boxed and are great for resale. Contents are for display purposes only and can be purchased separately. When you need to store an assortment of supplies for convenience and cleanliness, choose this attractive triple compartment box with removable lid. Perfect for spa, salon or retail counters, fill each section with your choice of sponges, cotton, gauze, or other disposable applicators. The boxes can also be stacked on top of each other to create a multi-tiered display. Contents are for display purposes only and can be purchased separately. 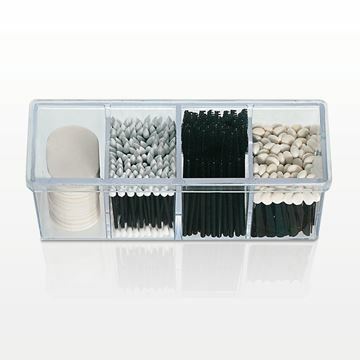 This clear polystyrene beauty organizer box with lid is perfect for storage of disposable swabs, applicators or sponges. Organize your supplies and keep them clean and fresh, ready for your next customer. Contents are for display purposes only and can be purchased separately. 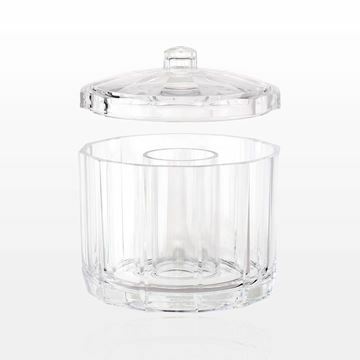 Organize and store essentials in this 750 ml clear polypropylene container with convenient, removable flip top lid. Perfect for stowing bobby pins, hair pins, bands, small beads, and tall enough for larger styled hair clips. 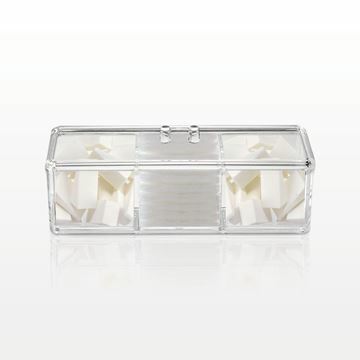 Organize your work space with our luxury acrylic beauty organizer. 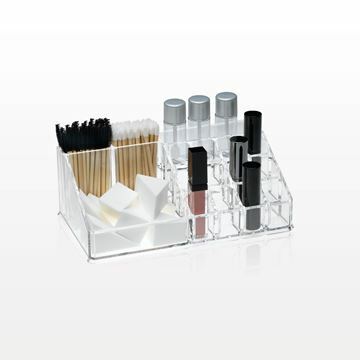 This multi-compartment organizer provides slots for brushes, swabs, applicators, lipsticks, and more. Contents are for display purposes only. 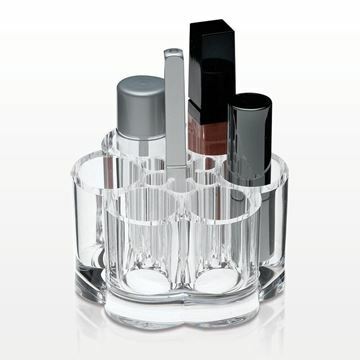 Our adorable flower shaped lipstick and brush organizer is made from clear acrylic. This small pretty storage holds six tubes and six pencils, lip liners or thin brushes. When space is tight, choose this organizer. Each organizer ships in its own box, so this is a perfect item to sell at retail counters. Contents are for display purposes only. 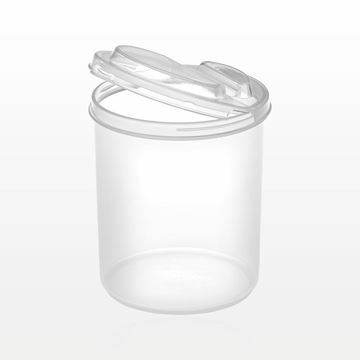 Organize and store essentials in this 210 ml clear polypropylene container with convenient, removable flip top lid. Perfect for stowing bobby pins, hair pins, bands, small beads, and hair clips. 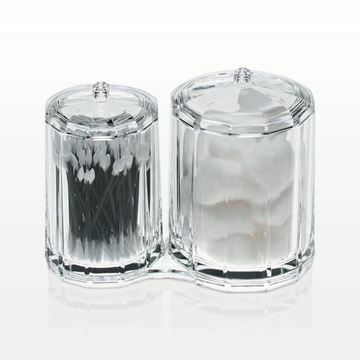 Our luxury faceted acrylic cylinder is suitable for holding swabs and applicators, sponges or cotton balls. The removable lid with molded knob allows for easy access to the contents of this attractive supply container. Use on beauty workspaces, rest room counter tops, or sell these individually boxed acrylics at your own retail counter. Contents are for display purposes only. 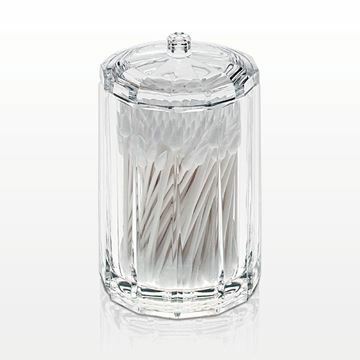 Our shorter luxury faceted acrylic cylinder is suitable for holding swabs and applicators, sponges or cotton balls. The removable lid with molded knob allows for easy access to the contents of this attractive supply container. Use to organize beauty workspaces, rest room counter tops, or sell these individually boxed acrylics at your own retail counter. Contents are for display purposes only and can be purchased separately. 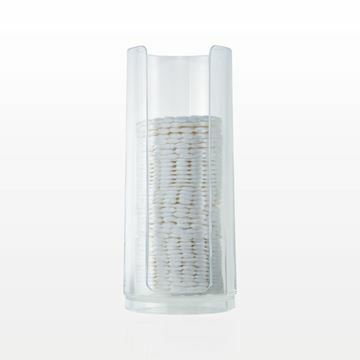 Our petite luxury faceted clear acrylic cylinder is suitable for holding sponges, cotton balls and other disposable supplies at retail counters. The removable lid with molded knob allows for easy access to the contents of this attractive supply container. 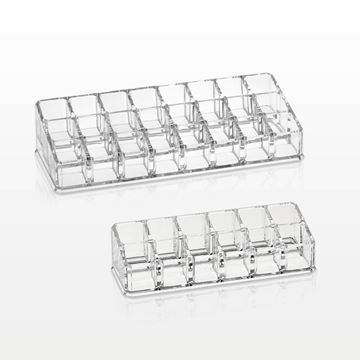 Use this item to organize beauty workspaces, store rings or other jewelry. It comes individually boxed and is great for resale. This multi compartment luxury acrylic beauty organizer offers a tidy way to keep lipsticks and other tubes upright and easy to see. 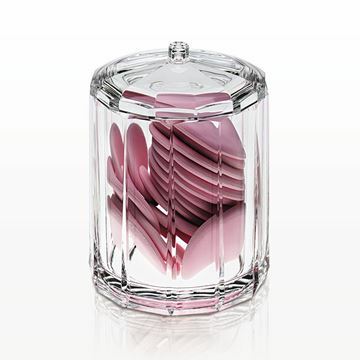 Perfect for salon workstations or retail counters, this storage unit is made of clear acrylic. Contents are for display purposes only. Organize and store essentials in this polypropylene container with convenient, removable flip top lid. Perfect for stowing bobby pins, hair pins, bands, small beads. The large container is tall enough for larger styled hair clips. Ready to Fill! 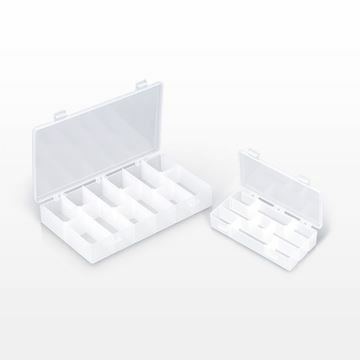 This empty beauty supply organizer is perfect for storing your disposable cosmetic applicators and hair accessories such as bobby pins, hair pins, duck bill clips and hair bands. The supplies lay nicely inside this polypropylene box with dividing partitions that are easily adjustable and can create up to 9 compartments for Part # 88881 and 16 compartments for Part # 88882. 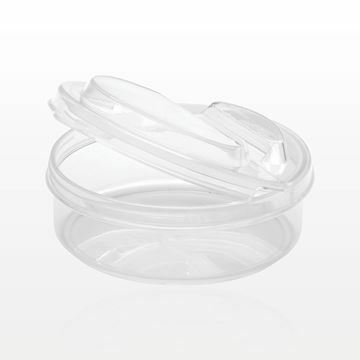 The lid seals with two clasps to keep items secure while traveling. The size of these organizers make it ideal to fit into your kit or store on top of a counter. Can also be used to store nail art supplies and other craft supplies. Compartmentalized makeup organizers are designed especially for displaying beauty supplies. 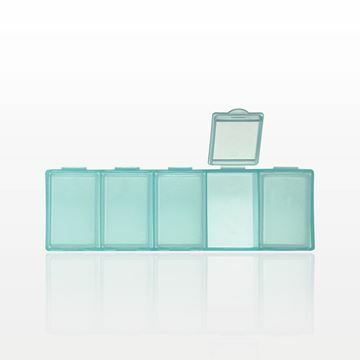 Our organizers come in small to large sizes andthey hold both cosmetics and disposables. We offer brush holders, lipstick organizers and multi-compartment containers . Innovative designs allow you to optimally organize applicators and makeup within a workspace or retail display. You’ll find sturdy boxes with lids that keep cosmetics in place. 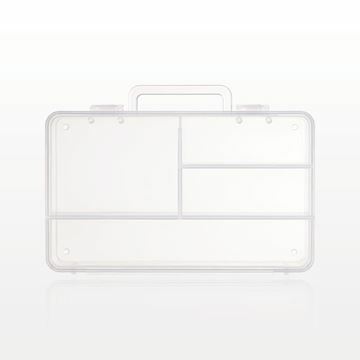 They are the ideal, on-the-go organizers for professional makeup artists. An acrylic organizer can be a smart, sleek addition to any retail countertop. We also have makeup organizers in slotted designs that feature the flexibility of adjustable partitions. When placed on the cosmetic counter, these products put frequently used swabs and sponges within easy reach of both customers and sales associates. 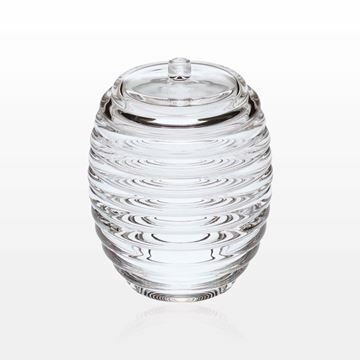 By browsing our packaging selection, you can easily order lidded jars, flip-top containers, miniature organizers, or large kits with divided sections to meet your unique requirements. When space is at a premium, our cosmetic storage products are the perfect solution. They keep everything from disposable makeup applicators to wholesale hair accessories separated, clean, and ready for use. Our organizers come in specialized designs to securely hold cosmetics, pedicure products or beauty supplies. You will find makeup storage options in your choice of dimensions, materials and styles. 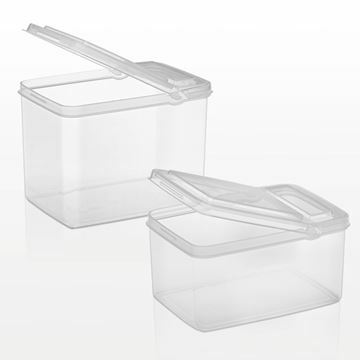 An organizer with a removable lid can be a convenient storage container. Simply remove the top to make essentials, such as cotton, immediately accessible within the spa, salon or retail space. Remember, we welcome your product questions and are here to help you order your favorite organizational and display items today.